The Mount Holly Community Museum is located in the village of Belmont. Take Route 7 South to Route 103. Turn left on Route 103 (toward Ludlow). Turn right (on Belmont Road) when you come to the blinking yellow light over Route 103. Continue on Belmont Road to the village of Belmont (approximately 2 miles). Turn right (on Tarbellville Road) and The Will White Blacksmith Shop Museum will be on your right. Turn left on Healdville Road. Continue on Healdville Road to the village of Belmont. Continue straight (on Tarbellville Road) and The Will White Blacksmith Shop Museum will be on your right. Take Route 11 to Londonderry. In Londonderry, turn left on Route 100 (toward Weston). Continue through Weston. You will come to the intersection of Route 100 and Route 155 (approximately 8.5 miles after leaving Londonderry). At this intersection, stay straight. You will be on Route 155. Approximately 6.5 miles later, you will come to the intersection of Route 155 and Tarbellville Road. (There is a sign that points to the right and says, "Belmont 1 mile"). Turn right onto Tarbellville Road. The Will White Blacksmith Shop Museum will be on your left as you come into the village of Belmont. Perkins House is on the right adjacent to the Church Green. 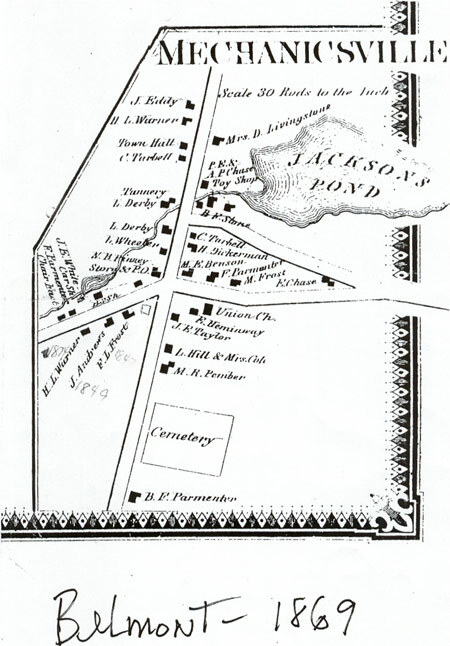 A map of Mechanicsville (now Belmont) circa 1869.